Available in elastic and rigid forms, back braces are sometimes worn while a spine is healing from an injury to limit movement in the affected area. You may also wear a brace if you have a job requiring heavy lifting. Regardless of why you are wearing one, keep some essential dos and don’ts in mind. If you will be putting your back brace on and taking it off on a regular basis, make sure you understand how to do this correctly. 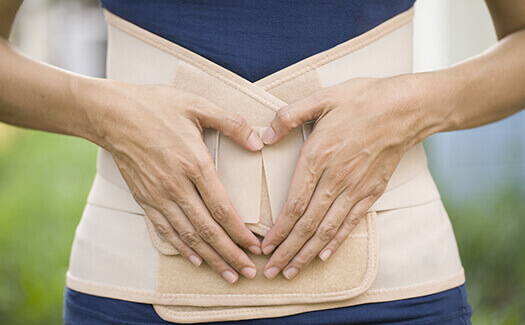 Wearing a back brace improperly could cause more pain or leave you vulnerable to injury while it’s worn. It may be tempting to save money and borrow a friend’s back brace, but doing so could provide little or no relief. Back braces are specifically designed and fitted for each patient. Your back brace shouldn’t be pressed tightly against your skin. Wear comfortable, loose fitting clothing to prevent sweat and moisture from accumulating. Back braces aren’t intended to be a substitute for other treatments. Follow any instructions from your physical therapist or board-certified back physician about exercises and stretches you can safely do to strengthen your spine and supporting muscles while using a brace. Most back braces should be taken off while bathing or showering. Follow any guidelines you may be given to avoid damaging parts of the brace, especially if you have a brace with fabric or elastic parts. Should you experience new or worsening back pain while wearing a brace, it may be a sign of a new or previously undiscovered problem. Report anything out of the ordinary to your Beverly Hills back doctor. Though a brace may not be necessary during all stages of recovery, it’s best to wear it when recommended by your back surgeon. Whether you need traditional spinal fusion or Coflex back surgery, Beverly Hills surgeons at The Spine Institute can determine the most effective treatment for your condition and help you take the first steps toward a pain-free life. Call 310-828-7757 today to schedule an in-person evaluation.